In October 1958, Oliver Smoot, in a pledge to the Lambda Chi Alpha fraternity at MIT, was measured head over feet from one end of the Harvard (Mass Ave) Bridge to the other. 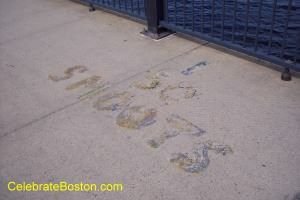 At intervals of 10 Smoots, hash marks were spray-painted onto the bridge's east sidewalk, from Cambridge over to Boston. The fraternal length of the bridge is 364.4 Smoots, plus or minus one ear. 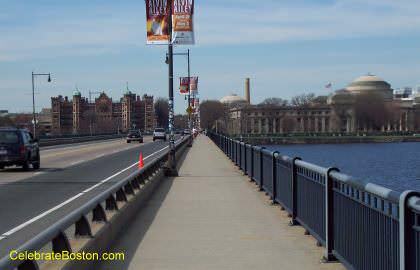 The bridge is officially named after John Harvard, and is locally referred to as the Mass Ave Bridge. Each year members of the fraternity re-painted the hash marks, until Smoots became folklore on both sides of the Charles River. In 1983, a plaque was placed on the Cambridge side of the bridge commemorating the event, but was later stolen. The bridge was completely renovated in the late 1980s, and the Smoot-marks were quickly added back onto the east sidewalk. Oliver Smoot was 5'7" in 1958. 364.4 Smoots equals about 2035 feet in length. The bridge is actually 2170 feet in length, or about 135 feet longer (24.2 Smoots). The reason for the discrepancy is that the bridge has a ramp from Storrow Drive on the Boston side, and the MIT students stopped measuring at this ramp. In 1958, there were actually two Storrow Drive ramps on the Boston side opposite each other, making the bridge appear shorter (the students could have stopped measuring at the ramp for safety reasons also). The Smoot-marks have become a minor tourist attraction in Boston over the years. In 2008, on the 50th anniversary of the frat pledge, a plaque was again placed on the Cambridge side of the bridge to immortalize the event. From a practical perspective, some joggers use the Smoot-marks to measure their progress as they cross the bridge. It has been said that accidents are sometimes reported to police using the Smoot-marks to identify its location on the bridge, and the marks have been there long enough for this to be true. An interesting aspect of the Smoot Pledge is that a Smoot has become an obscure unit of measure. Smoots are listed with Nybbles and Googles from this one prank back in 1958. A Smoot-to-Feet or Smoot-to-Meter calculator is impractical of course.